Ideal Size For Smaller Roofing or Remodeling Jobs. 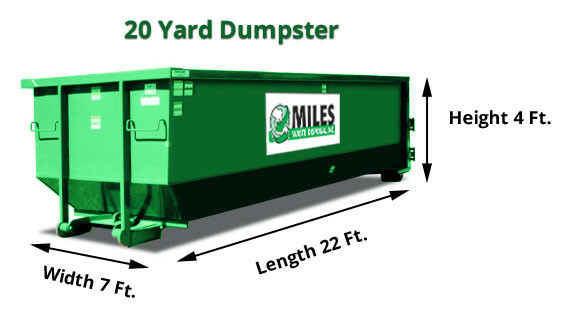 Our Most Popular Size Dumpster. Perfect For Any Small To Mid-Size Residential Or Commercial Projects. Good Choice For Medium Size Remodeling Projects, Commercial Roofing Jobs, or Larger House Clean Outs. Largest Dumpster Miles Waste Disposal Has To Offer. For Any New Construction, Commercial, Or More Junk Than You Know What To Do With Kind Of Jobs.